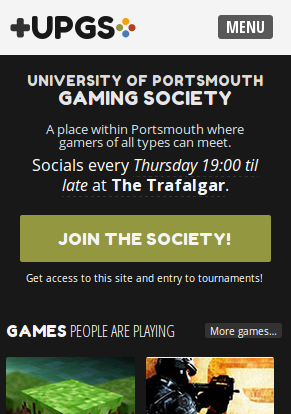 The University of Portsmouth Gaming Society came to us looking for a place to allow their members to find and play games with each other. First we worked with their logo, their initial logo used the d-pad and buttons and they wanted us to bring it through to the new revamp. We kept it simple and bold so it would be recognisable in different places. We produced a few colour variants and sizes for broad use, whether that be websites or their Fresher’s Fayre stall banners. A screen capture of the UPGS website. The site would allow users to sign-up attach their gaming networks (Steam, Xbox Live) and social networks. From there the games your playing would be automatically sourced from the gaming networks attached, with the option to manage games manually. This is all with the goal of finding others in the society playing the same games and quickly connect with them. Server information had to be clear and simple. We implemented a one click copy-to-clipboard of the server address making it painless to paste it into the corresponding game or application. For certain games such as Minecraft we could access the data of the players in the game itself, giving a glimpse at who is playing in real time. We wanted the linking of accounts simple, from the user settings clicking ‘Link’ would prompt you to link the respective account to your profile. Linking accounts can be done from the user settings. This linking was important especially for codes such as the Nintendo Friend Codes being notoriously hard to share amongst your friends. "UPGS" by ROSE Digital is licensed under a Creative Commons Attribution-ShareAlike 4.0 International License. Open source emoji from Emoji One.